Acuma has unrivalled expertise in Business Intelligence, Analytics, Data warehouse, Information Management, Cloud enablement and migration along with support, training, web development and testing. Acuma’s value proposition encompass strategic consultancy, micro-services, program management for digital transformation in the discovery, alpha, beta and live phases of Digital by Default standards. 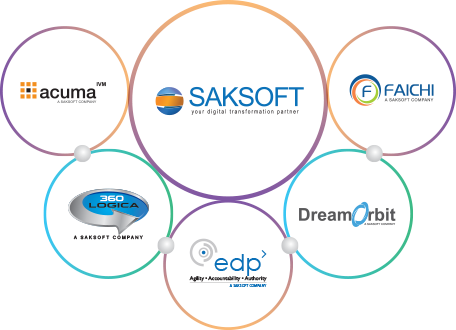 As part of the String of Pearls, Acuma also leverages the complimenting strength of the other companies in Saksoft group to help clients with their Digital Transformation Journey. Digital tools are plenty these days and they are influencing the business environment across all areas – customer experience, productivity and collaboration. Hence, businesses are constantly subject to, new threats, competition, channels and opportunities. To tackle all these challenges amidst growing complexities in technology, it is imperative that businesses embrace the digital transformation revolution. Digital transformation helps define business strategies based on technical capabilities and creates new-age applications to automatically extract critical information from the huge amount of data available. This, in turn, enables informed business decisions to be made on-the-fly. The ever-widening influence of mobility, analytics and cloud on every aspect of the business makes it all the more important to be agile. At Acuma, we have evolved from offering on-demand technology solutions to leading clients towards Digital Transformation. For us this journey started with building digital competencies within the organisation and using these experiences to take our clients on a digital transformation journey. Acuma delivers high quality, accredited training services which enable our customers to translate course theory into practical business benefits in the workplace quickly and effectively.